who would Mehr likely kill someone? What do Du like most about Sideshow Bob? 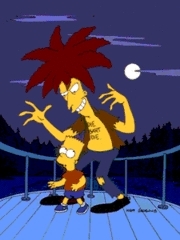 has sideshow bob ever killed anybody? because on black widower bart says to bob that the only victems where the over people in the hotel... oder something close to that! a question Wurde hinzugefügt: Does "underdunk" have some kind of meaning? (I'm italian) Thanks! a comment was made to the poll: Do Du think Sideshow Bob has ever acted gay?